The Filigree Heart Pendant Urn is available in Sterling Silver, Gold Vermeil (click on the gray tab titled Detailed Images to view), or 14k Gold. The vermeil pendants are plated with 100 milligrams of gold, the best grade of plating. 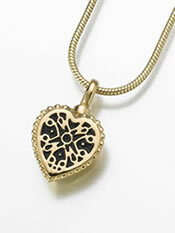 This small keepsake pendant measures 1/2" tall x 1/2" wide. Filling and care instructions, a small funnel, and gift box are included.